The leaf muntjac is a small deer weighing about 11 kg (25 lb). It is found in dense forest habitats at an elevation of 450 - 600 m (1500 - 2000'), where it is solitary and eats mostly fruit. The leaf muntjac was first identified by scientists in 1997. Its currently known range comprises the mountainous regions northeast of Putao and south of the Nam Tamai branch of the Mai Hka River in Myanmar. Hunting with snares has apparently reduced the leaf muntjac's numbers over the last decade, even though it is not considered a particularly valuable species because of its small size and antlers. *** The leaf muntjac is the smallest true deer in the world, standing about 60 - 80 cm (2 - 2.5') tall. *** Muntjacs are also known as "barking deer" because they make a deep, barklike sound as a warning if they sense a predator nearby. 2003: The leaf muntjac has not yet been assessed by IUCN. 1999: Occurs in Myanmar (Amato et al. 1999). The leaf muntjac's currently known range comprises the mountainous regions northeast of Putao and south of the Nam Tamai branch of the Mai Hka River in Myanmar (Rabinowitz & Khaing 1998) . Hunting with snares has apparently reduced the leaf muntjac's numbers over the last decade, even though it is not considered a particularly valuable species because of its small size and antlers (Rabinowitz & Khaing 1998) . The leaf muntjac weighs about 11 kg (25 lb). The leaf muntjac is found in dense forest habitats at an elevation of 450 - 600 m (1500 - 2000'), the transition zone between tropical lowland forests and higher temperate forests (Rabinowitz 1998) . 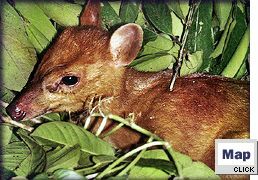 Young muntjacs are generally born in dense jungle growth, where they remain hidden until they can move around with their mother (Nowak 1999) . The leaf muntjac eats mostly fruit (Rabinowitz 1998) . Both diurnal and nocturnal activity have been reported for muntjac species in general. The leaf muntjac is solitary (Rabinowitz 1998) .